Blowfish Restaurant’s newest extension, cocktail and sake lounge BarFish (668 King St. W) opened its doors with a warm welcome. It’s easy to see why this latest addition to King West satisfies Toronto’s demand and trend for designer cocktails and Asian fusion tastes for the last decade. Located on the corner of King and Bathurst, in the historic Bank of Toronto building, Blowfish received an overhaul and extended its former patio to bring its outdoor space inside to create the new cocktail bar lounge, BarFish. The well-stocked bar stretches across Barfish’s long narrow space, accommodating around 60 people, though the soaring ceiling in this intimate sprawl reveals a much more grandiose loft style. We had the pleasure of trying some of BarFish’s unique cocktails, accompanied by a delectable menu from the restaurant. Award-winning and resident mixologist Nishan Nepulongoda served up the Cucumber Dream – a refreshing exotic gin-based cocktail, mixed with calamansi juice (Filipino lemonade), muddled with coriander, lime, and of course, cucumber. The humble bar chef was all smiles when he explained the ingenuity behind his concoction. The tasting menu began with the tantalizing Blowfish Giant Ebi Shooter, and as the name suggests, the portion size doesn’t disappoint. I was pleasantly surprised by the simplicity and remarkable flavours of the Hot Oil Hamachi – buttery slices of yellowtail, drunk in a mixture of hot olive oil and sesame oil. A glass of Blowfish’s own delicate traditional sake paired well with the equally delicate, melt-in-your-mouth Roasted Miso-marinated Black Cod. I’m a sucker for cod, and Blowfish definitely knows how bring out the best of this fish without a lot of fussy ingredients. The most entertaining dish of the night, Japanese A3 Wagyu Strip Loin, was brought before us with a scorching hot stone. This grill-it-yourself creation is the perfect social dish to share, not to mention fun to cook. The beautiful marbled wagyu slices sizzled with fury on the hot stone – a melting spectacle much needed for this chilly winter. To cool our taste buds, the Mochi Ice Cream Trio was a charming and whimsical end to our dinner. The lightness and subtle sweetness of this dessert balanced out the decadent fatty dishes. Seemingly inspired by a fusion of Japanese and Chinese flavours, I felt a tinge of nostalgia from the green tea mocha ice cream. Great food, while allowing quality, fresh, and simple ingredients showcase its menu is what Blowfish is all about. Similarly, BarFish follows that same philosophy with its own unique blend of elements for cocktails. An exciting mash-up of inspiring food and drinks, this revamped restaurant and bar duo on King West is a hit. 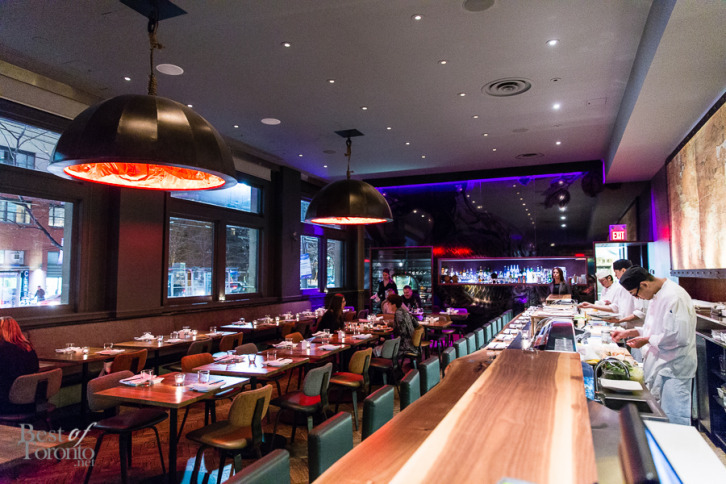 Lead photo of the Blowfish dining room by Nick Lee. Photos below by Pedro Marques except where indicated.